However, when she clicks on Sent Mail, the message list shows only that each e-mail was sent by Claire, not who it was sent to. In other words, there's no column that shows the recipient's name for each message. 1. Run Windows Mail, then go to your Inbox, Sent Mail, or whatever view you want to modify. 2. 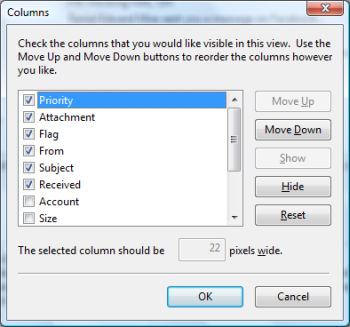 Right-click anywhere in the column header above your messages and choose Columns. 4. Before clicking OK to exit, note that you can also change the display order of the columns. Just click any column and then click Move Up or Move Down to change its spot in the order, keeping in mind that the top-to-bottom order in this list corresponds to left-to-right in the mail view. That should do the trick, Clare!